Many of you are heading over to Kamasylvia as it was released recently. However, do you know of the new PVE content called ‘Valtarra - Altar of Training’? We will introduce how to start ‘Valtarra - Altar of Training’ and its rewards in this GM note. ■ First Time Going to the Altar of Training? What is the Altar of Training? It's a PVE content tower defense game where you need to protect the sacrament in the middle from the monsters that are summoned. If you’re a level 58 or higher Adventurer, you’ll get a quest from Black Spirit that’ll take you to Kamasylvia. You can get the quest ‘Light to Valtarra’ after you complete the main quest called ‘Ancient Mirumok Ruins’ in Kamasylvia Part 1. 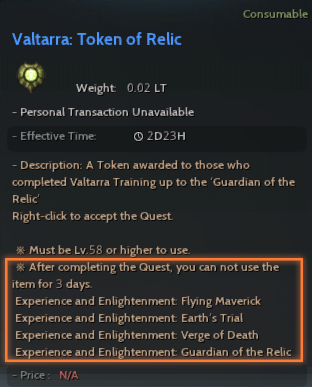 You can try Valtarra - Altar of Training for the first time by doing this quest. You’ll need to clear 3 stages in the Altar of Training of introductory difficulty. You can try the normal difficulty after you complete the introductory difficulty. ▲ You must be in a part of 2 or more members to use the Altar of Training. To take on the normal difficulty Altar of Training, you need to get a quest from ‘Milford’ the Valtarra - Altar of Training Node Manager by talking to him. Then you’ll need to spend 100 energy to get the ‘Valtarra: Training Manual’ and use it at a specified location. The quest you can get from talking to Milford can be repeated once every 3 days. 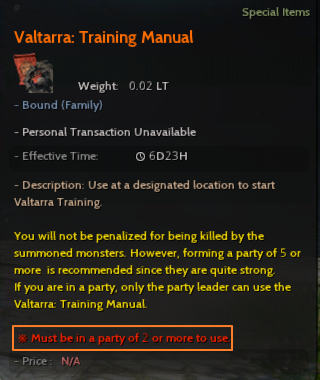 You can get the ‘Valtarra: Advanced Training Manual’ from from a quest like the normal difficulty. However, the quest for the advanced difficulty can be done once per week. The training is divided into 5 different levels and the monsters and bosses that appear during each level are different. ▲ You’ll need to look up at the sky carefully during level 2 as there are monsters that can fly. The next level will start after a certain amount of time has passed during Altar of Training in introductory and normal difficulty. The monsters from the previous level won’t disappear and continue to attack even after the next level starts. You’ll fail if a single sacrament is destroyed during the Altar of Training. So it is crucial to check for remaining monsters before moving onto the next level. You can return to Milford for rewards when you’ve successfully completed the Altar of Training. Advanced difficulty can only be done once per week compared to normal difficulty which can be done once every 3 days, additional obstacles that makes it harder to protect the sacrament, and different conditions for clearing training. In the advanced difficulty, the next level won’t start until you’ve defeated the boss and the monsters from the level will disappear. So you can move onto the next training. Time Attack is also in effect for the advanced difficulty. If you cannot defeat everything within the set time limit, you’ll fail. Level 1 – ‘Venom Crabs’ that spray poison to their surroundings. Level 2 – ‘High Flying Kisleev Harpy Mages’ appears high above and attacks the sacrament. Level 3 – ‘Golem Summoning Stone’ that summons golems continuously. Level 4 – ‘Cultists’ that make Hexe Marie stronger when they die. Level 5 – ‘Ancient Relic Power Stone’ that stops Ancient Kutum and Ancient Weapons from attacking Adventurers. This difficulty is hard due to the additional obstacles.Still, you can get great rewards by completing it by working together with other Adventurers. ■ What are the Rewards? The rewards from introductory to advanced difficulty are great so you won’t want to miss out on them. You’ll get 5 Black Stones (Weapon) and (Armor), Contribution Point EXP, Combat EXP, by completing the first Altar of Training in introductory difficulty. You’ll get Combat EXP and a ‘Valtarra Training Reward Bundle’ by completing the normal difficulty that you can do every 3 days. 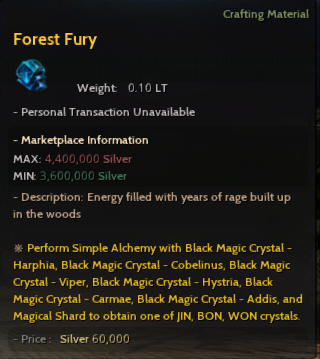 The bundle contains Black Stone (Weapon), Black Stone (Armor), Hunter's Seal, and Forest Fury. ▲ You can get a Magic Crystal of a higher grade if you process a Black Magic Crystal with it. You won’t get a special reward for completing the Advanced Altar of Training which you can do once a week. Instead, you can get special seals from each of the bosses from every level. You can combine the seals to make them into Valtarra Tokens. The tokens can be right clicked on in your inventory to start a quest that can be completed by talking to ‘Milford’. 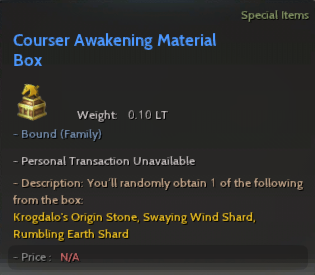 The items you can get by opening the reward bundle for completing the quest are Valtarra Eclipsed Belt, Courser Awakening Material Box, Black Stone (Armor), Black Stone (Weapon), Hunter’s Seal, Forest Fury, Gold Bar,and Valtarra's Scattered Aura. 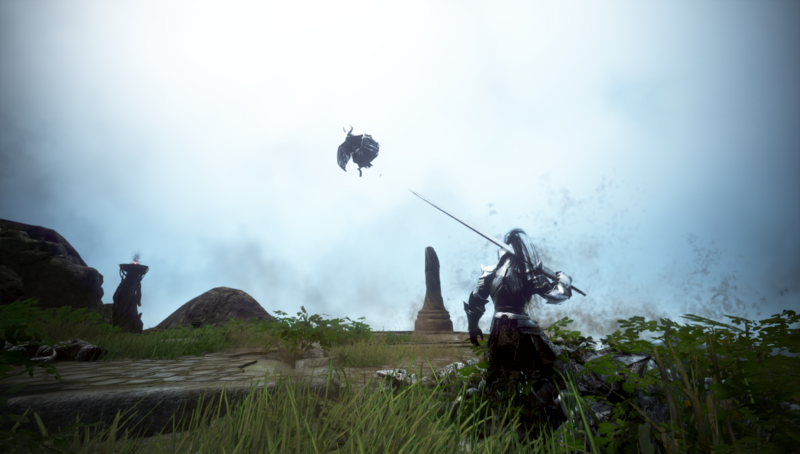 ▲ You can get materials you need to make your Tier 8 courser into a Dream Horse. 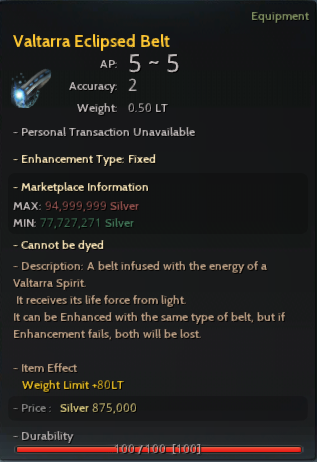 ▲ Gather 20 ‘Valtarra's Scattered Aura’ and exchange them with Milford to get 1 ‘Valtarra Eclipsed Belt’. * The order of items getting combined may vary. ▲ You can accept quests from these tokens once every 3 days. 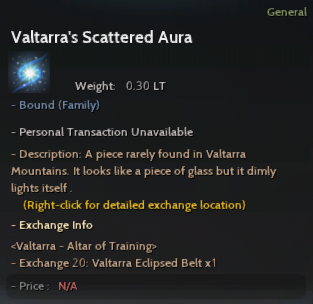 ※ You can get more Valtarra’s Scattered Auras from tokens made with more seals. There are titles that can only be earned from Altar of Training in advanced difficulty as well. The titles have something to do with the additional obstacles which makes the training harder than usual. Venomous: Defeat ‘Venom Crab’ at Valtarra - Advanced Altar of Training. What Goes Up Must Come Down: Defeat ‘High Flying Kisleev Harpy Mage’ at Valtarra - Advanced Altar of Training. Kill First, Ask Questions Later: Defeat ‘Junk Golem’ at Valtarra - Advanced Altar of Training. A Cultist Among Us: Defeat ‘Cultist’ at Valtarra - Advanced Altar of Training. Time Controller: Defeat ‘Ancient Relic Power Stone’ at Valtarra - Advanced Altar of Training. We hope you found this GM note helpful and that many of you will go out and give Valtarra - Altar of Training a shot. We shall return with more useful facts!